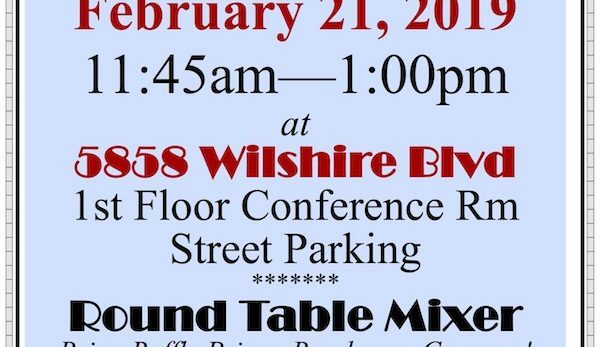 Due to rain we will be dining at 5858 Wilshire Blvd., Los Angeles, CA 90036 in the 1st floor conference room. The Craft Contemporary (formerly CAFAM) will be open for GMMCC Members to enjoy after the lunch. This month will be a Round Table Mixer so bring your elevator pitch and cards. We will also hear about what is new at the Craft Contemporary museum and get a peek at their beautiful exhibitions. Love to have you. Enjoy Rocco’s Pizza and Italian Buffet! When: Thursday February 21st, from 11:45 am to 1:00pm. Where: Craft Contemporary – 5814 Wilshire Blvd. RSVP Required by February 19th so we can have a count for catering and seating arrangements. RSVP at 323-964-5454 or info@miraclemilechamber.org.